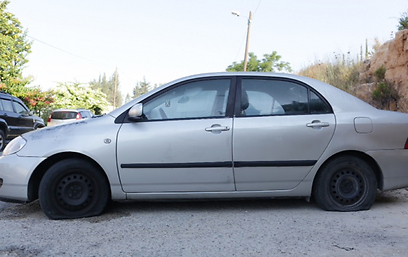 The tires of 28 cars in the Arab village of Abu Ghosh near Jerusalem were slashed early Tuesday morning. Graffiti reading "racism or assimilation" and "Arabs out" was sprayed on nearby walls. One of cars belongs to former Knesset Speaker Avraham Burg. Police are investigating the case and estimate the attack was racially motivated. However, they are not ruling out other lines of investigation. This is the latest in a line of attacks on Arab areas in and around Jerusalem. 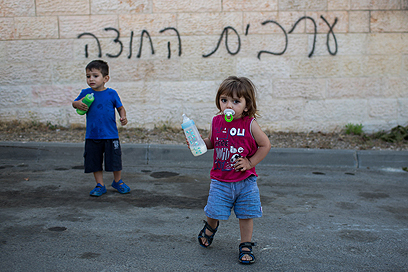 Last Friday saw two cars torched and hate graffiti sprayed in east Jerusalem's Sheikh Jarrah. Abu Ghosh itself has not witnessed such hate crimes in recent years. 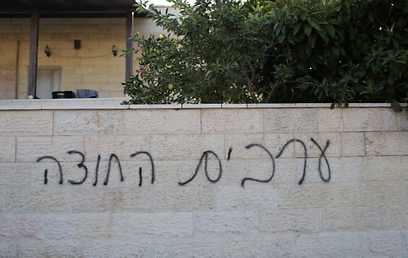 The attacks have led to calls to crack down on radical Jewish vandals. On Sunday, the political-security cabinet decided that the defense minister will outlaw the "price tag" movement, exercising his authority subject to the emergency regulations. The attorney general, justice minister, internal security minister and the Shin Bet chief all recommended to label it a terrorist organization. The cabinet's decision provides security forces fighting the phenomenon with greater investigative and legal latitude. Outlawing the "price tag" movement will allow extended remand periods, the possibility to hold suspects without the presence of lawyers and the possibility of confiscating property and bank accounts. Security forces had struggled to bring the perpetrators to justice and few indictments were filed against them. One of the 28 cars whose tires were slashed belongs to former Knesset Speaker Avraham Burg who had left the vehicle with his friend Ibrahim Suleiman for repairs. "It's an old car of mine," he said. "The most important thing is that no one was hurt and that our friends are OK. It's utterly shameful." he said. Burg criticized the cabinet's decision not to label "price tag" attacks as acts of terror. "It's a story about good people and bad people and the bad people are those who did this to the people of Abu Ghosh. It's an act of terrorism. There are Jewish terrorists whom the government intentionally avoids punishing." Economy Minister and Habayit Hayehudi chairman Naftali Bennett commented on the matter on his Facebook page. "'Price tag' is immoral and un-Jewish. There is a small group of ill-seekers that want to destroy any chance of good neighborly relations between Arabs and Jews in our country. "This group provides our enemies with means to degrade us. We will not let them win. I call on the security forces to act forcefully against this despicable phenomenon." Tag Meir, a coalition of organization against hate crimes, will hold a rally in solidarity with the people of Abu Ghosh on Tuesday evening. "The responsibility lies with Prime Minister Benjamin Netanyahu," Director Gadi Gvaryahu said. "It's the far right's response to his decision not to label such crimes as acts of terror." 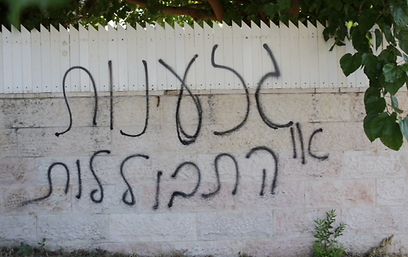 See all talkbacks "'Arabs out' graffiti in Abu Ghosh"